Congregation leaving worship service as gunman fired. CAIRO, Egypt (Morning Star News) – At least nine people were shot to death and several others wounded after gunmen attacked parishioners leaving a worship service this morning in a town south of Cairo, according to the Egyptian Interior Ministry. Eight of those killed were Christians, officials said. 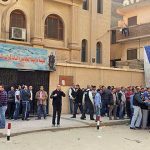 Some of those wounded were in critical condition after the attack by two gunmen on a motorbike at about 10:30 a.m. on the St. Menas “Mar Mina” Coptic Orthodox church in Helwan. One of the gunmen dismounted and tried to break through the security barrier in front of the church premises, but police stopped him, the Interior Ministry said in a press statement. The assailant reportedly shot and killed the non-commissioned officer, and then he shot randomly at parishioners as they were coming out of the church building. Security forces returning fire injured the assailant while his accomplice tried to break through the security barrier and enter the church building with explosives, according to the Interior Ministry. Its statement said one of the gunmen escaped, while the other, who also had an Improvised Explosive Device, was wounded and arrested, but state media reported that the wounded attacker was killed. The Interior Ministry reportedly identified the wounded assailant as Ibrahim Ismail Mostafa and said that he had been involved in previous attacks. Besides six people around the church building and the security officer, two other people were killed when one of the gunmen previously shot at nearby shops, according to the Interior Ministry. Church staff members quickly closed the doors to the building as the gunmen fired at the door, walls and worshippers, leaving bullet holes and blood around the site, witnesses said. The exchange of gunfire went on at least 15 minutes, witnesses said. Security had been ramped up since early December with extra forces and police checkpoints at the gates, in addition to the church security. Some nearby streets had been indefinitely closed, while others had been closed only during church services. Health ministry spokesman Khaled Megahed told state television that eight of the slain victims of the attack were Christians, and one was Muslim. He said there were five people injured, including two women in critical condition, and that one of the gunman had been killed. Coptic Orthodox Christians celebrate Christmas on Jan. 7, and they are concerned about more attacks. 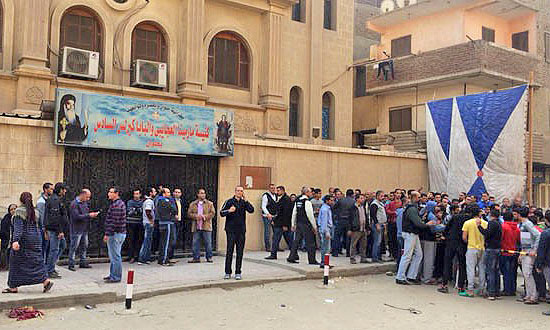 Police and the armed forces have reportedly increased security and closed all churches in the Helwan area. The Interior Ministry said the gunmen who escaped is an active militant who has committed other terrorist attacks against police and military personnel. The attack follows the killing of a Coptic Orthodox priest outside Cairo in October. On April 9, bomb attacks on two Coptic churches holding Palm Sunday services in different cities in Egypt killed at least 44 people and injured more than 100 others. Just last week, hundreds of Muslim demonstrators stormed an unlicensed church south of Cairo, wounding three people. The demonstrators shouted anti-Christian slogans and called for the church’s demolition, according to the local diocese. The demonstrators destroyed the church’s fittings and assaulted Christians inside before security personnel arrived and dispersed them. Egypt is ranked 21st on Christian support organization Open Doors’ 2017 World Watch List of the countries where is it is most difficult to be a Christian. © 2017 Morning Star News. Articles/photos may be reprinted with credit to Morning Star News.